Installed on 15 Jun 2005. Latest update 20 Nov 2015. Van Maanen's Plate XV(1), with comparison stars labeled in red. Two VLA/VLBI water maser study areas are indicated by green crosses. An image scale is shown in red in the lower left-hand corner. The scale of the motions is indicated in the lower right-hand corner (left-hand in mirror image). The length of the arrows represents the motions during an interval of 2,500 years. (1) Pg. 267. A spreadsheet with the comparison stars data and scaling calculations is at: m33rcm.xls. van Maanen's image above has been East-West "mirrored" to match conventional celestial maps. Each pixel in the image has an estimated angular size of two arcsecs. According to van Maanen's proper motion velocity measurements, none of his comparison stars should have moved enough since 1922 to have changed their photographic positions by at least one pixel on this digitized image. In contrast, the rapid mover (#367), which van Maanen rejected as being a member of the nebula, could have moved by as much as three pixels. (This appears to have happened. The blink comparators that can be linked to below are by no means of such a quality that any serious astrometry can be done using them. Ritchey's 1910 image of M33, used in the blink comparators, is scanned from a journal article picture. Each photographic image has radial distortions which much be mathematically corrected to do astrometric work based on the image. The following two diagrams show the kinds of radial distortion (in exaggerated fashion) that exist in the images used for this article's blink comparators. The author of these pages is of the opinion that van Maanen's internal motions in spiral nebulae were actually rejected by mainstream cosmology (which is focused on the idea of the big bang with it's expanding universe, populated by other island universes, i.e., galaxies). If van Maanen's internal motions are real, their magnitudes would imply that the whole observable universe is comprized solely of the Milky Way and its very nearby environment. Spiral nebulae wouldn't be island universes, and they would be no further from us than the Milky Way's galactic halo. For more on this idea, see Cosmology's Missing Mass Problems - Part 3. Comments on Knut Lundmark's "Studies of Anagalactic Nebulae"
Lundmark(2) reported internal motions in M33. These were on the same order of magnitude that van Maanen found, but he concluded that the motions were of a random nature. 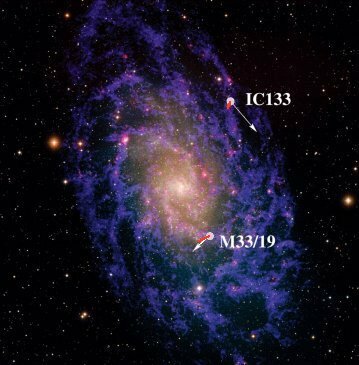 See M33 Internal Motions According to Lundmark. See the blink comparator (its not aligned right yet) which shows van Maanen's internal motions compared to Lundmark's. Two regions of water vapor maser activity in M33 have been being studied for internal motions since 1987(3)(4) using NRAO VLBI and VLBA facilities. The following image shows the locations of these two areas. M33 showing NRAO VLBI/VLBA locations for water vapor masers. Predicted motions (white arrows) are based on a M33 rotation curve and geometric/kinematic considerations. VLBA measurements [inserted by author of this webpage] are shown in red. These two water maser regions are indicated by green crosses on the van Maanen image at the top of this page. The author of this page intends to "look over the shoulders" of the researchers conducting the VLBI studies. A commentary on their findings (and problems), compared to those of van Maanen, follows. (I) - According to van Maanen, the faster moving objects in spiral nebulae tend to travel in stream-like/spiral-arm fashion. (Spiral nebulae/galaxies may have slow moving or even stagnant regions between the arms.) So far, the VLBI/VLBA studies have not focused on any object that van Maanen measured. (See image at top of this page.) In the author's opinion, until this happens, battle will not have been joined; the "battle" being that of a big expanding universe versus a Milky Way sized universe. New material to be added when found. "The maser emissions in M33/19 and IC 133 are variable on time scales less than one year. Between epochs, new maser features appeared and others disappeared. However we were able to detect and follow the motions of four features in M33/19 and six features in IC 133 over all four epochs. The feature identification was based on the positions and radial velocities of the maser emissions." Here is a graph (based on Table 1, ref(4)) showing the NRAO H2O M33 Maser observation dates. (2) Knut Lundmark, "Studies of Anagalactic Nebulae - First Paper," Nova Acta Regiae Societatis Scientiarum Upsaliensis, Volumen Extra Ordinem Editum, (1927). (3) A.L. Argon, L.J. Greenhill, J.M. Moran, M.J. Reid, K.M. Menten, M. Inoue, "The IC 133 Water Vapor Maser in the Galaxy M33: A Geometric Distance" - Astrophysical Journal, 615, 702 (2004).